ON THIS DATE (June 22, 1982) ... With the Red Sox trailing by two and down to their last out in the bottom of the ninth, Dwight Evans stepped to the plate and crushed a two-run homer to right. 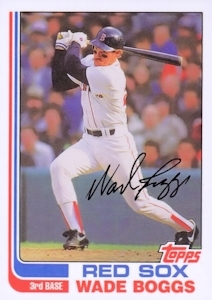 And, after teasing the fans for a couple of extra innings, the Red Sox sent everybody home with rookie Wade Boggs drilling a pitch into the net. Boggs' first major league home run came with one out in the 11th. In the ninth, he had pinch hit for Glenn Hoffman and grounded to second against Milt Wilcox. When he came up against Dave Tobik in the 11th, he worked the count to 3-2 and drove a fastball into the left-field net. Across the room, a man with 154 major league home runs was also smiling. If the Red Sox continue to do wondrous things, last night's victory over the Tigers will no doubt be remembered as the night Wade Boggs hit his first major league homer to win it. Perhaps only a handful of historians will recall that it was Evans' shot in the ninth which set the stage for Boggs.